The Chocolate Muffin Tree: Experiment: How Is Frost Made? We made frost! We've made snow in a previous post and that seemed to be a big hit with those of you who don't get snow, so I decided to do another experiment involving a wintery theme. (Actually we haven't gotten much snow here in NE Ohio/Midwest either so it seemed to be popular with everyone!) The experiment for this post: Making Frost! We found this experiment at Weather Wiz Kids here. Here is some real frost on our garage window which has been a rare sight this winter! There is a real beauty to the frost formations that you find on windows in the winter. Keep reading to find out how we made frost in the comforts of our own home. Fill one tin can 1/2 full with a mixture of crushed ice and 4 Tablespoons of salt. Mix it well for 30 seconds and let sit. In the other can put only crushed ice and cool water. Fill the can about half way full of ice and then just enough water to cover the ice. Now let both cans sit. Observe! One looks a little frosty already....can you guess which one? I asked C to guess which one she thought would form frost....she said, "The one with the salt." The frost was forming on the can with the ice and salt mixture. The other can with ice only was forming just moisture or dew! We added a thermometer to see what temperature the frost mixture was. Frost only forms at temperatures below freezing! We found this to be true! You can see the can on the left is close to zero with the frost on it! The can with just ice water is like a glass of ice water with moisture forming on it.....which makes sense! We found the thermometer measured above freezing on the can that formed the dew. The salt wants to absorb water to make a salt solution. To do that, the salt has to melt the ice into water. The heat needed to melt the ice comes from the ice itself. 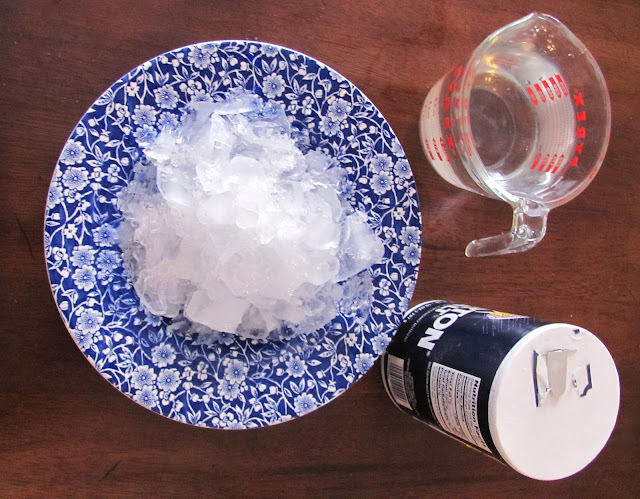 There is a chemical reaction between the salt and ice! Melting the ice actually makes the mixture cooler. The salt water mixture gets below freezing so the mixture on from the air collects on the can and freezes. On the other can, dew forms because the mixture of water and ice is just at freezing. The outside of the can is warmer so that is why dew forms! We have had very few days of below zero temperatures so there has been less frost! So the reason frost forms on windows and other surfaces is because the temperature outside goes below freezing. (just like the can) When the air becomes cooler, it cannot hold as much water as before. The excess water condenses on the windows. 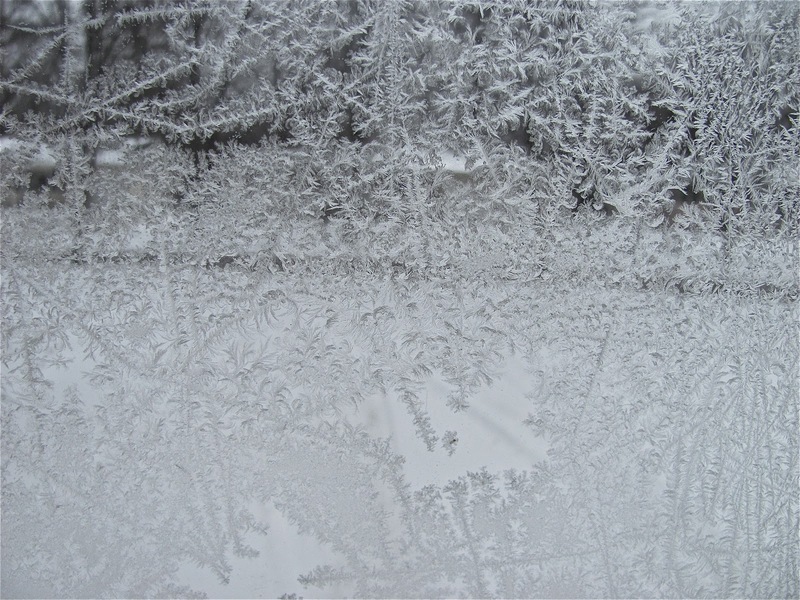 The water become crystalized or (interlocked crystals of water) when the temperature is below freezing. The cool patterns are formed because of the different air currents, dust particles, and because of scratches in the glass. Here is C looking at our frost on the garage. Check out this Google Image Search of Frost Photos which are simply GORGEOUS! We plan to create some Frost Paintings with Epsom like they did here at Brimful Curiosities blog. We checked out the book: Here Comes Jack Frost by Kazuno Kohara which was recommended in the same post. It goes well with studies about frost and if you are creating frost paintings! 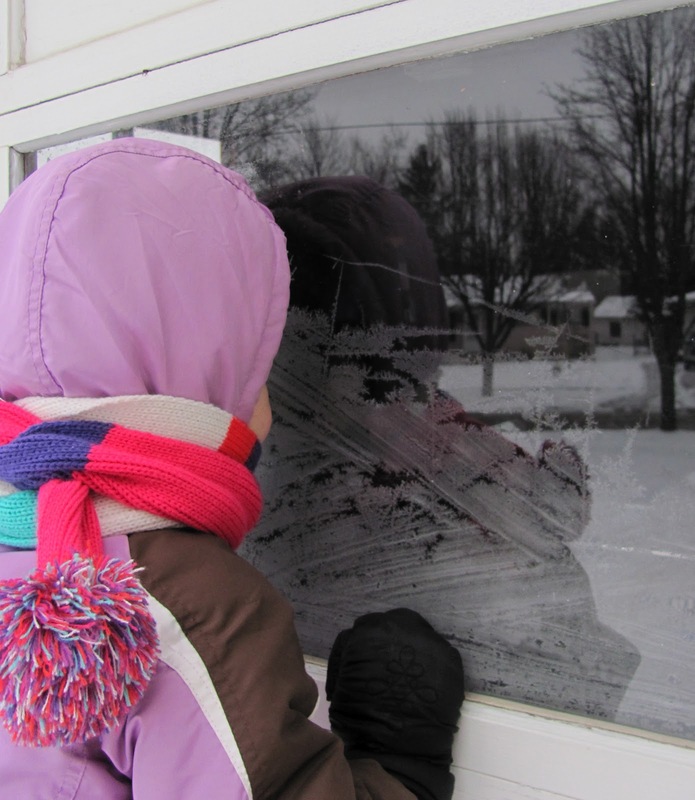 Have You Done Any Wintery Experiment With Children? This is very exciting!! Love all ur simple science experiments!! Thanks Roopa! We had a lot of fun with this experiment! I learned a lot too! Thanks! We've barely had a Winter here...! So I can kind of understand! The experiment is fun either way! Thanks so much for the good instructions! Our winter has been extremely mild, with little snow as well, I must admit it is nice for a change. I'm sure winter will return next year with lots of snow and freezing temperatures! Way cool... you are awesome! I definitely have to do this one! Wow what a cool experiment, love this!